Life is almost back to normal after the long recovery from our car accident in January 2018. With the arrival of Spring we are planning the first of an in-store Concert Series, a Recorder Workshop on Celtic Music the end of May and we are up-dating the music titles on our website please check the Featured button. Please note that our website does not take credit cards, this is for your protection and ours. If you would prefer paying with credit card Richie will give you a call (or you can call him) to get your cc numbers. Payment can also be made through PayPal, just let Richie know and he will email you an invoice. Also, check our latest New & Noteworthy flyer and our Recorder Teaching Schedule on the sidebar. Please explore our new Mobile-Ready website on your PC, smartphone, or tablet. It is designed to simplify the location and purchase of the instruments, music, and accessories which will expand your musical world. We hope to hear from you soon! 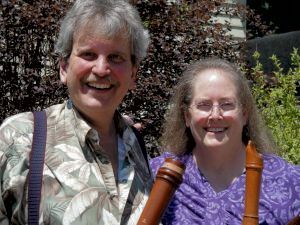 We are Richie and Elaine Henzler, two recorder players and teachers who are passionate about recorder and music. We both started playing recorder as young children and have never stopped. In our teen and college years we both played bassoon, graduating from The Juilliard School with BM & MM degrees and all the while, continuing to play (and teach) our true musical love, the recorder. Our goal is to help as many people as possible experience the same joy from playing recorder and making music with others. We are not just out to sell you something. With our depth of knowledge we can advise you about method books, all styles of music, instruments and general musical question you may have. Recorder is a melodic wind instrument that can play any period or style of music from medieval to contemporary. Need a teacher? Consider a Skype lesson with Elaine or Richie, two of the most patient Juilliard grads around, with over 25 years of experience with all age groups. Our rates are reasonable and the scheduling is flexible. Consider joining us at one of our workshops. If you are vacationing in the Adirondacks, stop by the store for a live lesson. We may not have the financial resources to keep a large inventory of recorders in stock but it is worth the wait and here's why - we provide value added service. Because wood is a dynamic material, every wooden recorder is slightly different; so, before sending a recorder out it is checked for speaking and tuning by Elaine with any necessary adjustments made. When you receive an instrument from us you'll be well satisfied. And remember, if you can't find what you are looking for here on our website, please contact us and let us find it for you. Courtly Music is now on Facebook! Photos, helpful notes, and more!